Orphan Black | TV, eh? There may be another attack of the clones coming to television. EW has confirmed that Temple Street Productions and AMC are in the early stages of development on a possible new series set in the Orphan Black universe. Variety first broke the news. Continue reading. And just like that, we’re off and running with a new season of Murdoch Mysteries. In last week’s return, we met architect Frank Lloyd Wright and saw the deadly consequences of being inside William’s potato cooking room when you’re not a potato. If you haven’t done so already, read my interview with showrunner Peter Mitchell, who gives some background on how the house came together. And, as always, some non-spoilery details after watching the screener. After playing Tatiana Maslany’s body double for five seasons, Kathryn Alexandre steps into the spotlight in a fun role: Florence Nightingale Graham, the businesswoman who founded Elizabeth Arden, Inc. Florence and George enjoy quite the romp on Monday night and it leads to a very, very funny scene. While George is getting goop on his face, Julia is dealing with tragedy at the University of Toronto School of Medicine. Veteran actor James McGowan is Doctor Forbes, who encourages Julia to perform surgery on a patient. Stephanie Belding returns to Murdoch Mysteries for a third stint, this time as Nurse Sullivan, a key witness in a patient’s death. Sebastian Pigott, most recently seen on Wynonna Earp this year and Frankie Drake Mysteries last year, is Dr. Dixon, a fellow student of Julia’s and none too happy she’s smarter than him. I’m glad all the work the crew did on the Frank Lloyd Wright home set is being used in more than one episode. It serves as the backdrop for William’s latest scientific gadget. In the summer of 2008, amidst the fallout of a damaging writers strike in the first half of the year, America broadcast networks were desperate for content. For CBS, one solution ended up coming from a strange place: Canada. What resulted from an unassuming find meant to just fill time was a series that would break the door down for shows such as Orphan Black and Wynonna Earp to thrive a decade later. That find? Flashpoint. Continue reading. If North Bay, Ont.’s tourism board is looking for a spokesperson, they should sign up Jerry O’Connell. The veteran actor of such series as The Defenders and Sliders speaks glowingly—and extensively—while discussing his next project, the Canadian original crime series Carter, debuting Tuesday at 8 p.m. ET on Bravo. The project, created by Garry Campbell (The Kids in the Hall, Todd and the Book of Pure Evil) was filmed in the northern Ontario city—as was fellow Bell Media series Cardinal—and focuses on Harley Carter (O’Connell), an affable Canadian lad who made it big as a detective on the hottest cop show on American television. 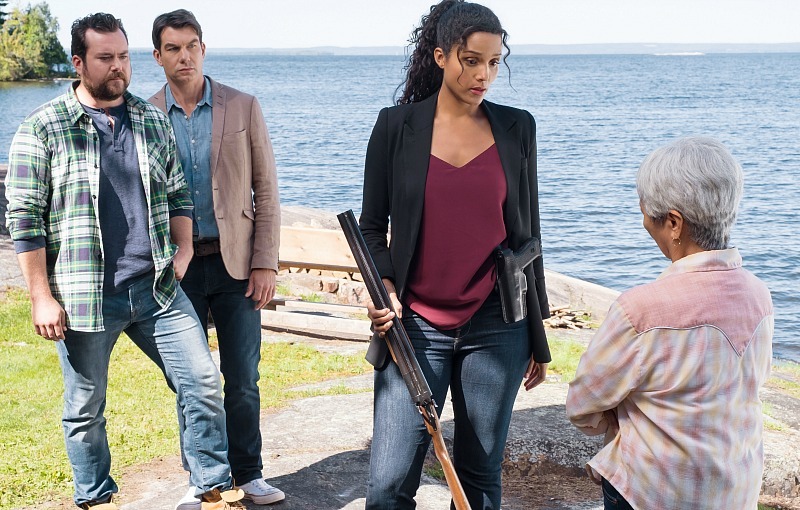 After a much-publicized meltdown, Harley has returned to his hometown of Bishop, Ont., where he reconnects with childhood friends Sam Shaw (Sydney Poitier-Heartsong) and Dave Leigh (Kristian Bruun). Sam, a veteran cop, quickly finds Harley inserting himself into her investigations while coffee truck owner Dave serves as Harley’s unofficial driver and wingman in some outrageous schemes. Unlike the dark, brooding of Cardinal, Carter is much more lighthearted, especially when Harley and Dave are bumbling their way through a plan to get information on a suspect. And, thanks for Harley’s years of playing a cop on television, he actually helps with investigations, much to Sam’s chagrin. Harley is far from his roots when viewers tune in to the debut instalment. Harley is basking in being recognized on the beach in Bishop when Sam appears and an awkward reunion follows. But when Harley’s housekeeper-turned guardian of 30 years is accused of murder (check out a photo gallery of Carter‘s cast, including Wynonna Earp‘s Varun Saranga) Harley demands he be included in the investigation. Yes, Harley is somewhat cocky, but what Campbell and his writing team of Larry Bambrick, Jenn Engels and Wil Zmak have created is someone immensely likeable. O’Connell, so long a co-star on series where he’s not the main man, steps into that role and owns it. The chemistry between he, Poiter-Heartsong and Bruun is palpable, especially in one key scene where the characters are relaxing in Muskoka chairs, sipping beer and recalling the old days. Carter airs Tuesdays at 8 p.m. ET on Bravo. Where has the time gone? It seems just like yesterday when Bell Media announced Carter was in production up in North Bay, Ont. Now we’re just days away from the debut—Tuesday, May 15, at 8 p.m. ET on Bravo—and we’re sharing some gorgeous gallery images of the cast below. Carter stars Jerry O’Connell as Harley Carter, the star of the hottest detective show in primetime television. After a much-publicized meltdown, Harley returns to the small town of Bishop to reconnect with his roots. Harley quickly reunites with his childhood friends Sam Shaw (Sydney Poitier-Heartsong) and Dave Leigh (Kristian Bruun) to solve crimes. Along for the 10-episode adventure are Varun Saranga as Vijay Gill, Brenda Kamino as Dot Yashuda, John Bourgeois as Chief Angus Pershing, Joanne Boland as Nicole Walker, Matt Barum as Wes Holm and Sherry Miller as Mayor Grace Hamilton. Carter was created and written by Garry Campbell, developed with writer John Tinker and produced by Amaze Film + Television. Scott Smith directs. Executive producers are Amaze Film + Television’s Teza Lawrence and Michael Souther, and producer is Victoria Hirst. Carter debuts Tuesday, May 15, at 8 p.m. ET on Bravo.